In 1982, both players also turned their talents in the recording studio. 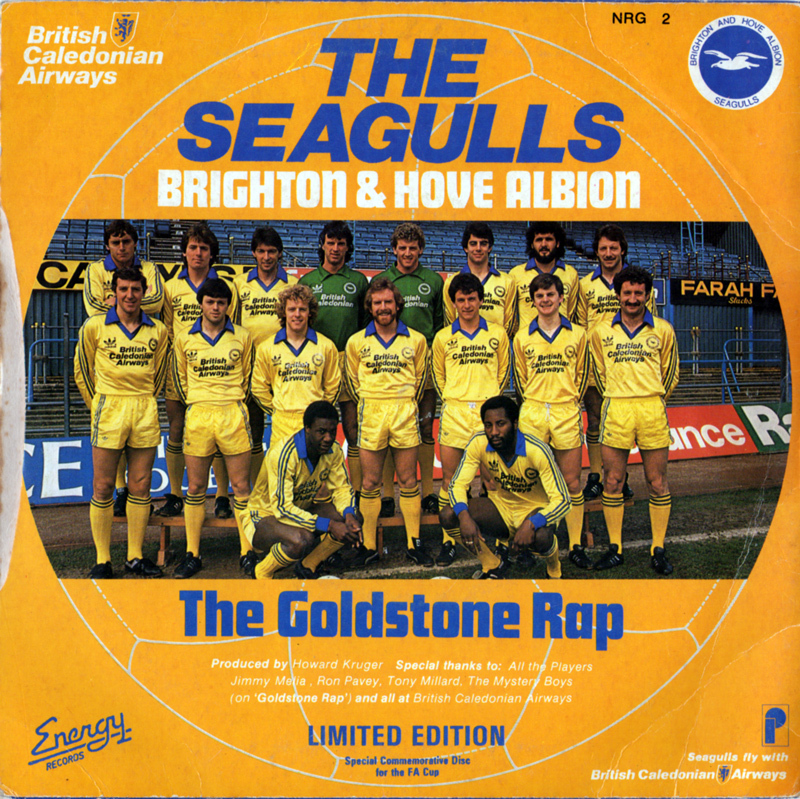 With the Albion, Foster had a stab at singing on ‘In Brighton’ / ‘The Goldstone Rap’. 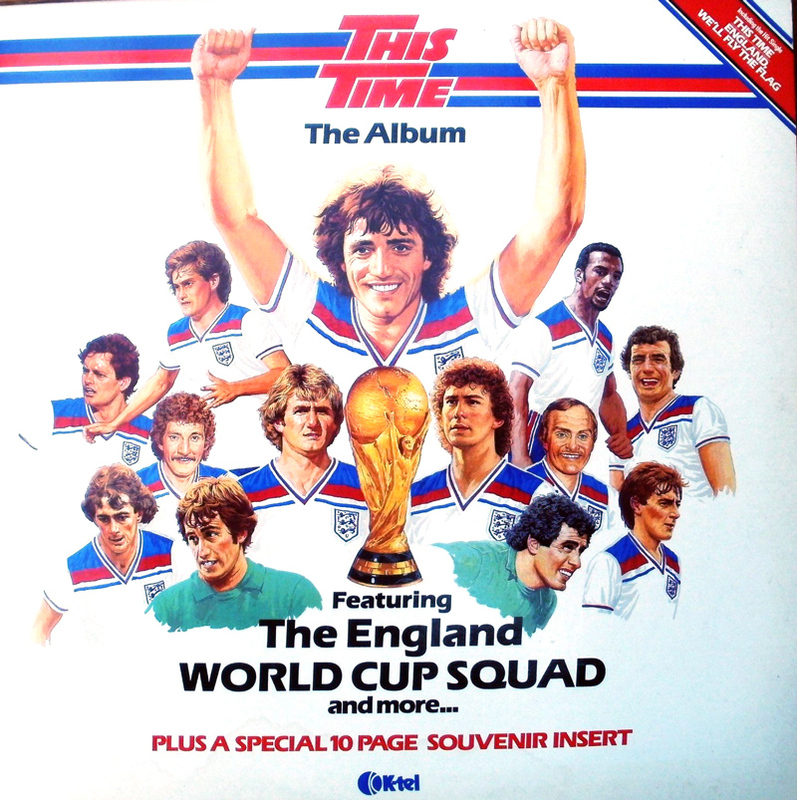 The FA’s resolute refusal to acknowledge disco, punk or even New Romanticism was partly tempered on the ‘This time We’ll Get It Right’ LP, where Justin Fashanu’s frankly astonishing ‘Do It Cos You Like It’ predated the thrust of Frankie Goes To Hollywood’s ‘Relax’ by at least a year. Even though I’m unable to play in the final, I’ll be in Brighton’s dressing-room, helping to both motivate and calm the players. i know the ones who have pre-match butterflies and the others, like Jimmy Case, who keep absolutely cool. What are they like, these lads who foce the greatest game of their lives? GRAHAM MOSELEY (goalkeeper): “Mose” is easy-going and always smiling. I’ve known him laugh when he’s had to pick the ball out of the net. But don’t be deceived. He might appear a bit casual, he can make saves that put him in the very top class – as he did against Sheffield Wednesday in the semi-final. CHRIS RAMSEY (right back): We call him “Yifter” – have you seen the way Chris walks? Our most consistent player since he came into the side. He’s headstrong and missed the semi-final after a sending-off. But I wouldn’t want him to curb his aggression. STEVE GATTING (central defender): To the lads, he is “Head”. It is big in relation to the size of his body. He’s always beaming, he’s a guy with a dry sense of humour who reads the game well, has good habits, and won’t panic. 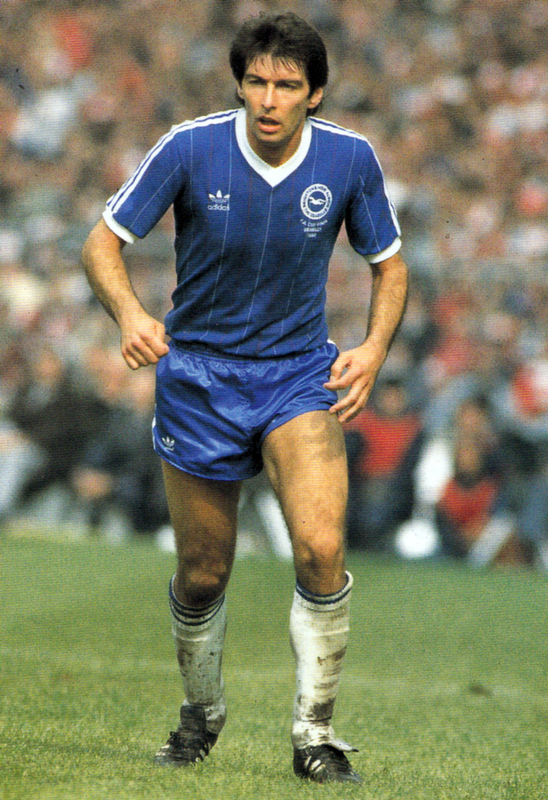 GARY STEVENS (central defender): He is “Grease”, because he looks like a Spanish waiter, or “Matt” to his close friends. They know why! He is very composed on the ball and is developing in the same mould as Mark Lawrenson, now with Liverpool. GRAHAM PEARCE (left back): To the rest of the team he is “Pleaty” because, he looks like Luton manager David Pleat. Graham is the quiet type. He has a great left foot and always wants main. NEIL SMILLIE (midfield): Neil wears glasses off the pitch and is “Specky” to everyone at Brighton. We reckon he should wear them over his contact lenses when he plays. I’m only kidding. He is one of the quickest players’ I have ever seen. His pace will worry United. JIMMY CASE (midfield): “Jimbo” is a hard man with a shot to match. I’ve seen people trying to split him in two. He has got up and laughed it off. If there was a war, I’d want him beside me in the trenches. 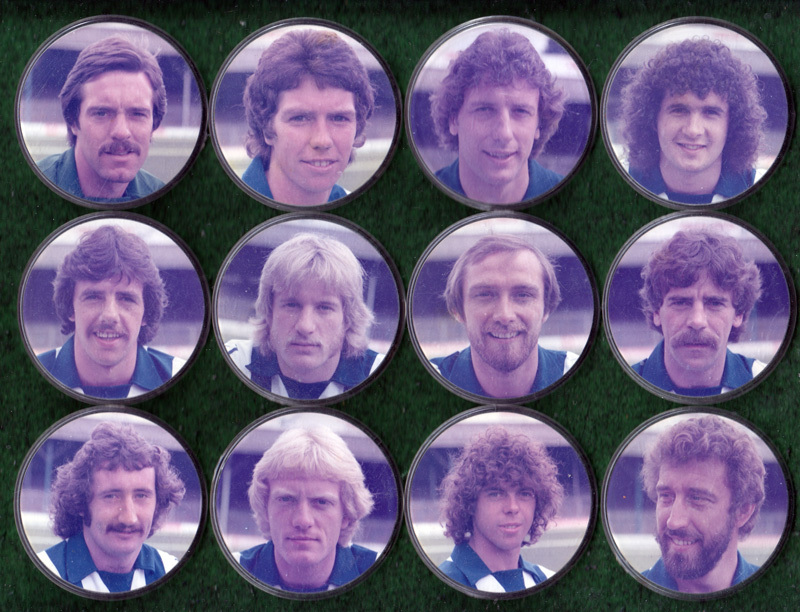 TONY GREALISH (midfield): “Sleeper” is the man I’d want on the other side of me in a war. He’s so honest, he accepts responsibility even when it’s not his fault. Tony is a natural leader. With me missing, he was the obvious choice to lead out the team at Wembley. He thrives on responsibility. GARY. HOWLETT (midfield): Known as “Fish”–but I can’t say why. Ask one of the other players! He is an Irish lad with bundles of skill who will love the atmosphere at Wembley. He could be another Liam Brady in a couple of years. GORDON SMITH (striker): “Smudger” has been at his best since coming back from a loan spell in Glasgow with Rangers. He has great cruse control, can destroy defenders with his skills. If he repeats his form of the semi-final, our players will all get winners’ medals. 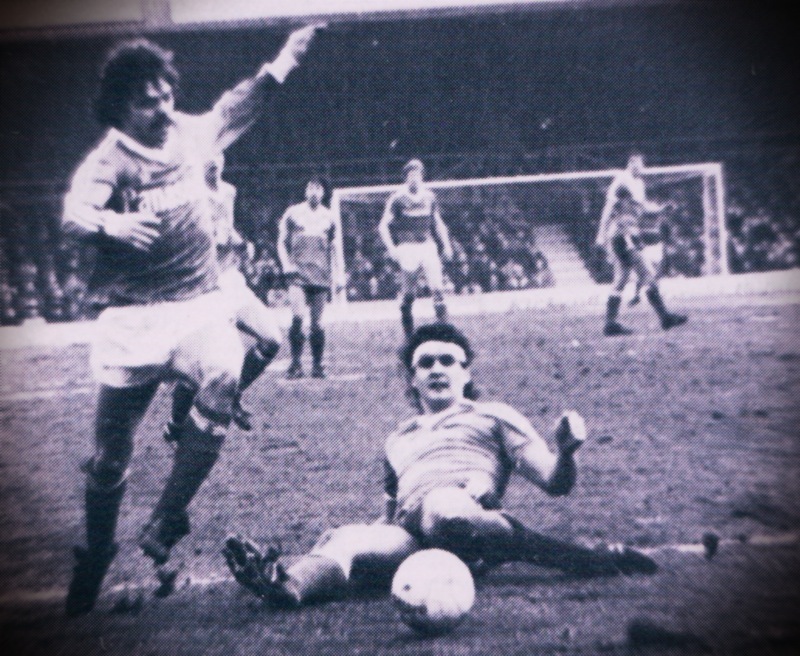 MICHAEL ROBINSON (striker): “Migraine Mick” or “Fatty” at the Goldstone. He’s one big headache to us all. Seriously, because he is a good friend of mine, Robbo is a man for the big occasion. I hope he shows us all his teeth when he scores the winner. GERRY RYAN (sub): is one of the most genuine guys in the game. A good finisher who won’t let us down if he has to come on. 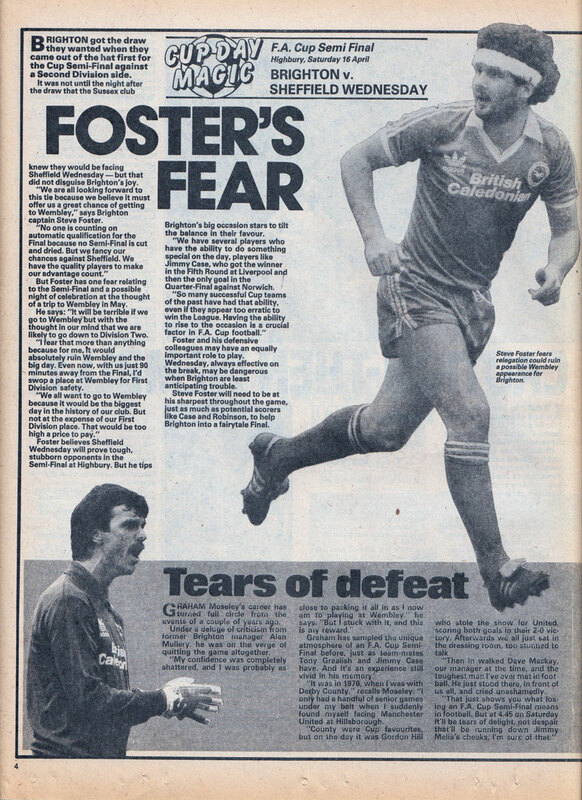 Many Albion fans, who were at the Notts County game later on April 1983, cast doubt on Foster’s account here. In the County match, Foster was booked and therefore suspended from the Final. However, many supporters believed he jeopardised the club’s survival chances by trying to get himself sent off to avoid missing out on Wembley. Meanwhile, Graham Moseley talks of being on the verge of quitting the game after being heavily criticised by Alan Mullery. Moseley went on to make many outstanding saves in the FA Cup semi-Final against Sheffield Wednesday. 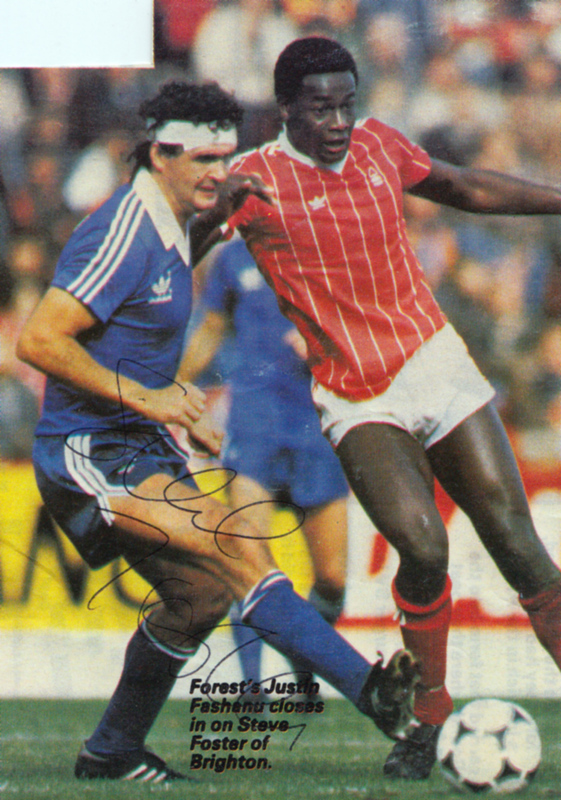 However, there was a sting in the tail as when Alan Mullery returned in 1986, one of his first changes to personnel was giving Moseley a free transfer. Composure and commitment – those are the qualities Brighton need in their fight to secure a First Division future. Skipper Steve Foster, who no one can accuse of a lack of effort, believes the work-rate has not been up to scratch in Brighton’s battle against the drop. As for effort, Foster criticises certain team-mates for producing below par displays in that area. He says: “I have the feeling we could have done better and given more, particularly away from home. I don’t intend to name names, but the players themselves know who I mean. Foster believes Brighton’s new attacking approach away from home is responsible for the need for greater effort. Foster sees improved form by his club as the key to his own prospects of earning further England international honours. “I think someone has told Bobby Robson I had retired,” jokes Foster. “But seriously, I don’t think it’s likely I shall be chosen while Brighton are struggling near the bottom of the table. “We have got to improve, climb the League and start playing consistent, successful football. Then I might have a chance of adding to my three England caps.” Foster denies he has been put into the international wilderness because of any question marks against his own form. “A player knows when he is playing well and when he is struggling,” says the Brighton man. “All I can say is, I hope to change Bobby Robson’s mind.” But any disappointment Foster may hide at his England exclusion since the World Cup will not be allowed to interfere with Brighton’s important last few months of the season. “This club worked very hard to get into the First Division and now we’re here, we want to stay, not let it all slip. * Here’s a reminder that The Goldstone Wrap will finish as a daily blog in 100 days’ time, on its 500th post. That’s June 24th 2014. There’s no significant reason – I haven’t even run out of archive material yet – it just feels like a good place to stop! All The Goldstone Wrap archives will remain online, and articles will continue to appear – only not on a daily basis. For those heartbroken at his departure, look away now. At a time when £1 million can just about fetch a player capable of those mystical qualities, ball control and vision, Nottingham Forest threaten to unleash a veritable basement bargain on the unsuspecting First Division. 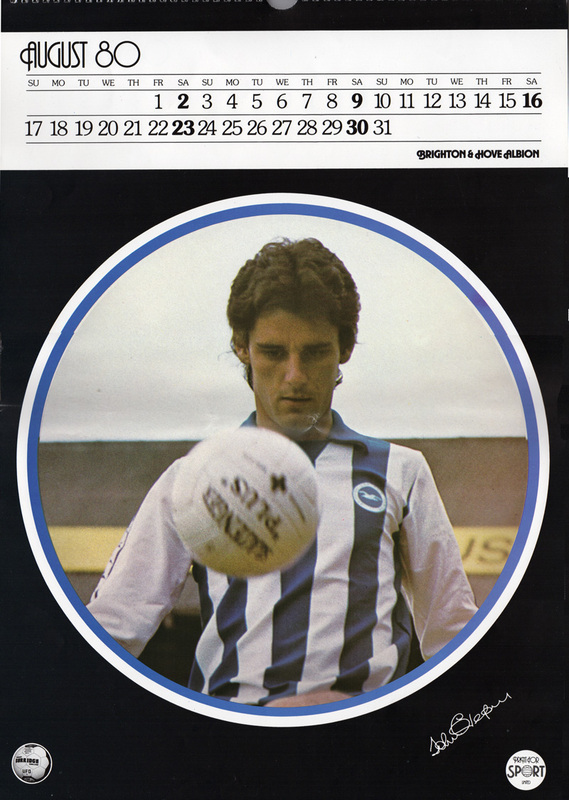 The sale of Peter Ward from Brighton to Forest for a reported £400,000 came as no surprise to those who became ultimately bored with the on-off transfer saga. But what will take away a few breaths is the opinion of assistant-manager Peter Taylor who believes that Ward is only one step away from becoming one of the best strikers in the game. 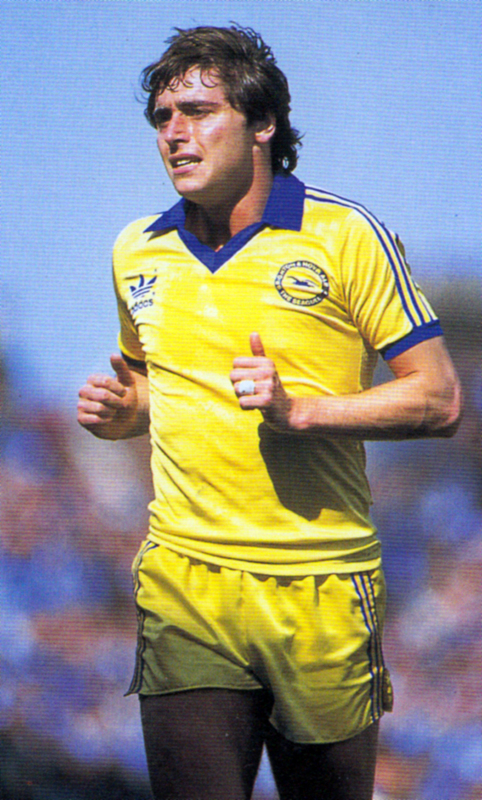 It was Taylor who signed Ward from Burton Albion during his reign as Brighton manager. For a while it seemed that he had unearthed a pot of gold as Ward revealed definite qualities of natural goalscoring instinct. 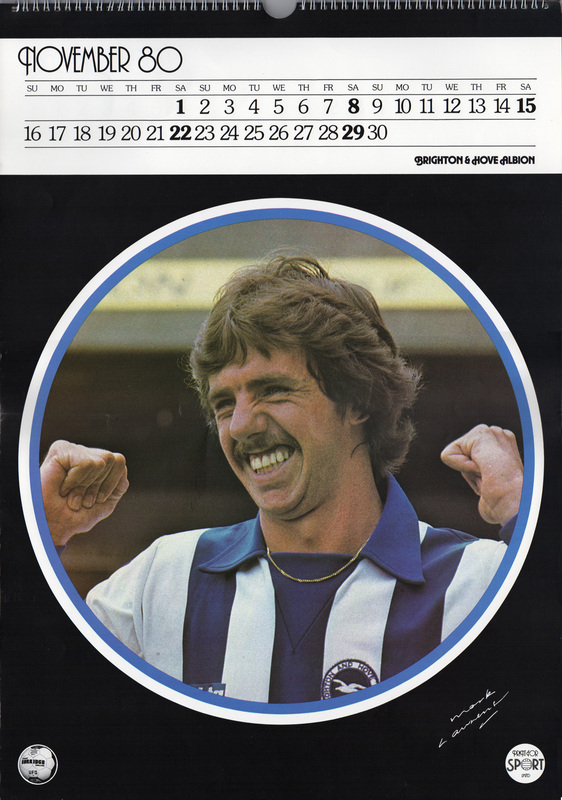 This season, however, the boy who became the idol of the Sussex Coast fired too many blanks for the liking of Albion manager Alan Mullery, who seemed almost relieved to complete the deal. 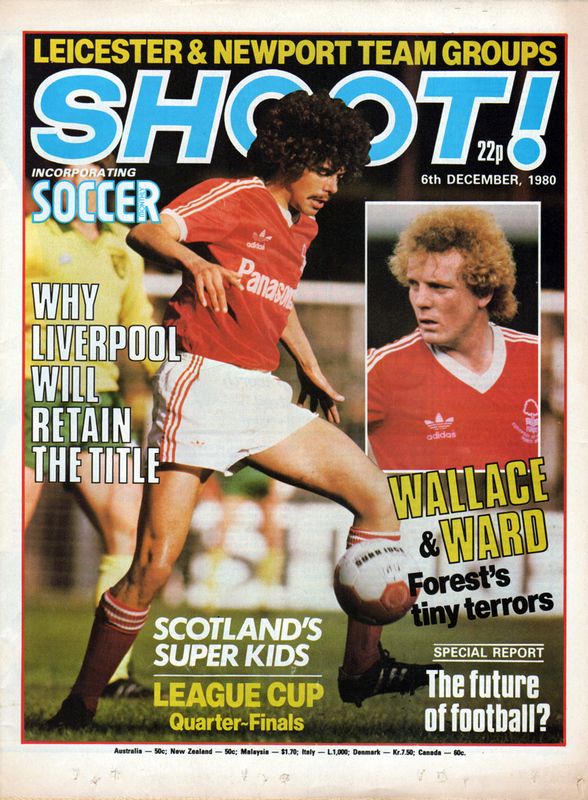 Forest unveiled their tiny-tot strike force of Scottish international lan Wallace and the unpredictable Ward against Leeds at the City Ground on October 22, and after goals by Wallace and Ken Burns sealed a 2-1 win, Taylor said: “Ward tore Leeds apart. His speed, skill and eye for openings proved too much for them. “People ask me why we play with two strikers, neither of whom tops 5′ 8” tall. But if you were to spend your time looking for a really tall striker to complete the target-man and partner combination you could be looking for ever. “There is a lot of nonsense talked about how tall strikers should be. The important question for any managerial team is… can this lad play? In the case of Peter Ward the answer is definitely “yes’. 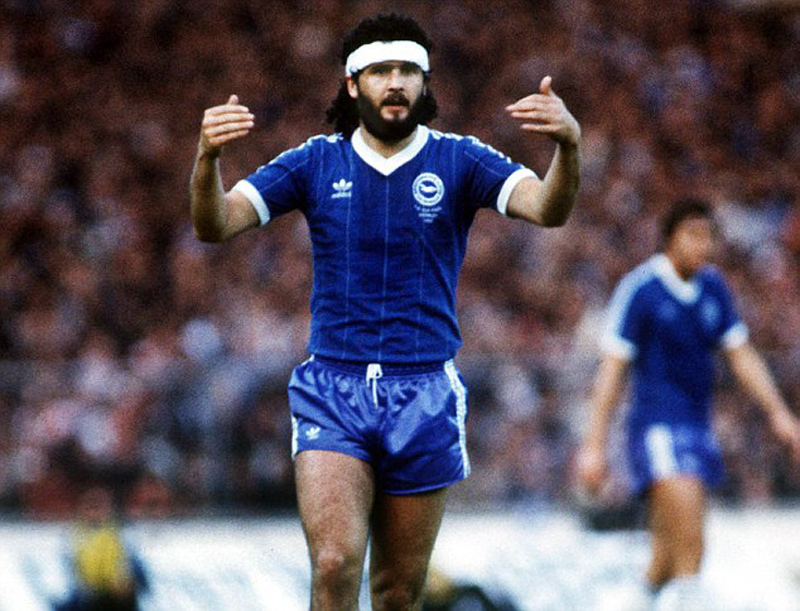 “In fact I am convinced that when he moves from Brighton back to his native Midlands and settles down, he will make a lot of people sit up and marvel at his ability. “We are more interested in the basic ability of our two strikers. And there can be no question that they pose nightmares for big defenders. Players with the qualities of Wallace and Ward will always get goals and always worry defences. “I don’t think people know just how good a player Ward is. It is just a matter of time before he settles into the Forest way of things, and then we will see him at his best. “The fact that neither of these players happens to be a giant is neither here nor there. Ability is the key, not stature. And these players have the ability.” Ward scored his first goal for Forest against Southampton on November 1 and looks more at home with every game. But what problems do the Forest mini-duo pose for the First Division’s top defenders? Arsenal’s giant Scottish centre-half Willie Young believes that the Forest duo are a sign of the times. Young said: “I probably speak for all central defenders when I say that we generally prefer to play against the bigger strikers, the likes of John Toshack, Derek Dougan and Joe Jordan. But times are changing and so is football. “If you look around the League you will find less of the big target players than, say, five years ago. The modern striker has to be sharp, mobile and capable of pulling a defence out of position. The days of the big man standing in the box waiting for a high ball to knock down are fast fading. “Down the road at Tottenham they use Garth Crooks and Steve Archibald. “Andy Gray and John Richards at Wolves are very sharp and mobile, Kenny Dalglish and Dave Johnson at Liverpool move all over the place. These sides don’t use a battering ram player down the middle. 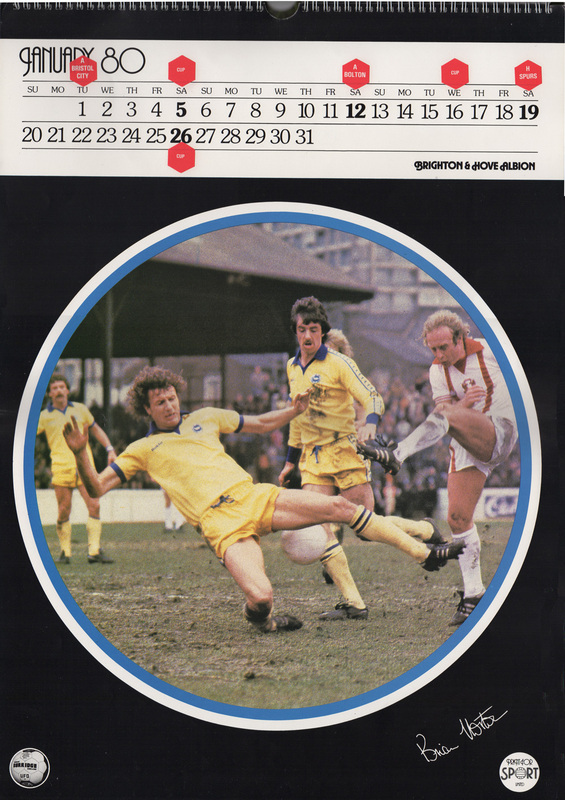 Winter pitches and tight marking may combine to upset Forest’s plans now that the running power and height of Garry Birtles no longer provides alternatives. But knowing Clough and Taylor it is more likely that Ward and Wallace will buzz and sting more often than they are swatted. 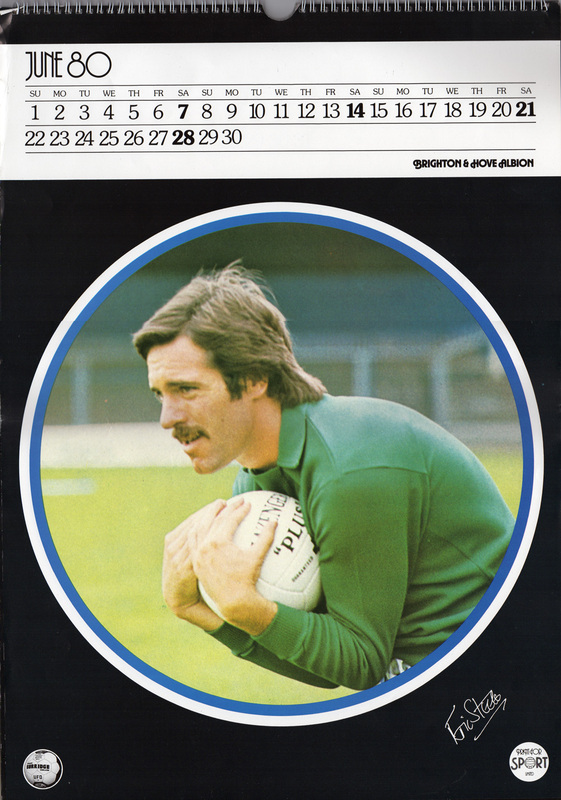 Before any side can beat Forest, they have to get past Shilton, and this proved beyond Albion’s capabilities. 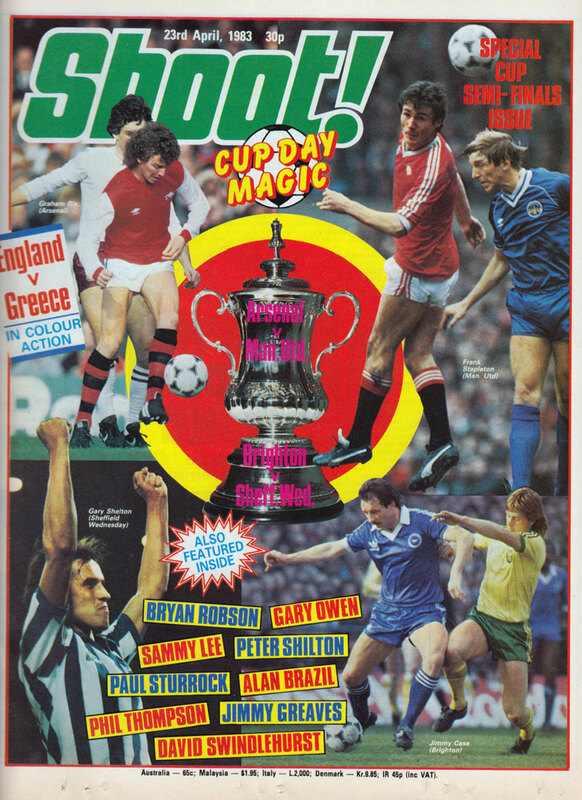 Not that Shilton alone stood between them and victory; on the contrary. But he was always there when required and in the meantime it was Ward, often quite scintillating, who plotted the downfall of his old club. Once he had settled down he led them a merry dance and impudently settled the issue with a header, which has never been his strong department. Ward’s goal followed a Bryn Gunn cross after John Robertson’s corner. 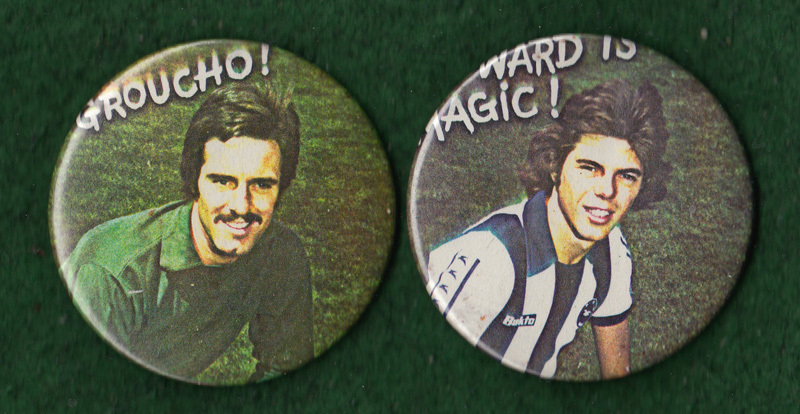 That he scored it with his head rubbed salt into the wounds for Steve Foster, often so dominant in the air. Foster did show he could match Ward’s pace in the second half, recovering well after Ward had stole the ball from him. However, in front of England manager Ron Greenwood, Ward’s artistry and aggression appeared to damage Foster’s World Cup chances. Gordon Smith can hear the men he now works with on the phone sometimes. ‘I’m working with Gordon Smith … yes, that one.’ Gordon Smith should have scored. He’d even scored a last-minute winning goal in a Cup final before, for Rangers in the 1978 Scottish League Cup. ‘It’s Hancock! What drama! In the dying seconds he has the chance to clinch the Cup for Stoke … and he’s done it! A shot so fierce that United keeper Paddy Roche has been carried through the net and impaled upon some railings here at Wembley. In 1983 Gordon Smith was in a position to live the dream. Wembley. The Cup final. The last minute. 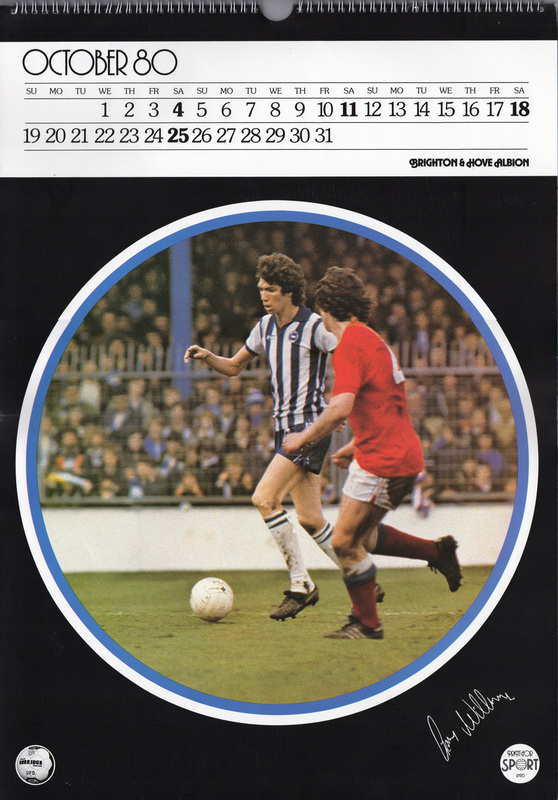 Manchester United 2, Brighton and Hove Albion 2. Michael Robinson had broken away, and the beleaguered defence was drawn to him like Stan Collymore to a signing-on fee. Robinson slipped the ball to the unmarked Smith, who steadied himself as the commentator – and very likely Gordon himself – cried: ‘Smith must score!’, and fired the ball at the keeper’s legs. If only Coronation Street uniped Don Brennan had been his opponent, this tale would have had a different ending. As it was, it was blond Brad Willis lookalike Gary Bailey, and he made the save. 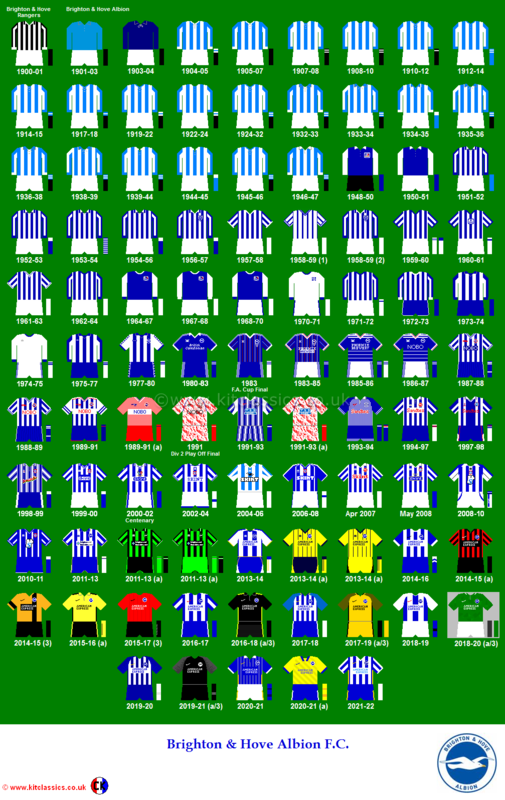 Inevitably United won the replay easily, and Brighton left Wembley empty-handed. 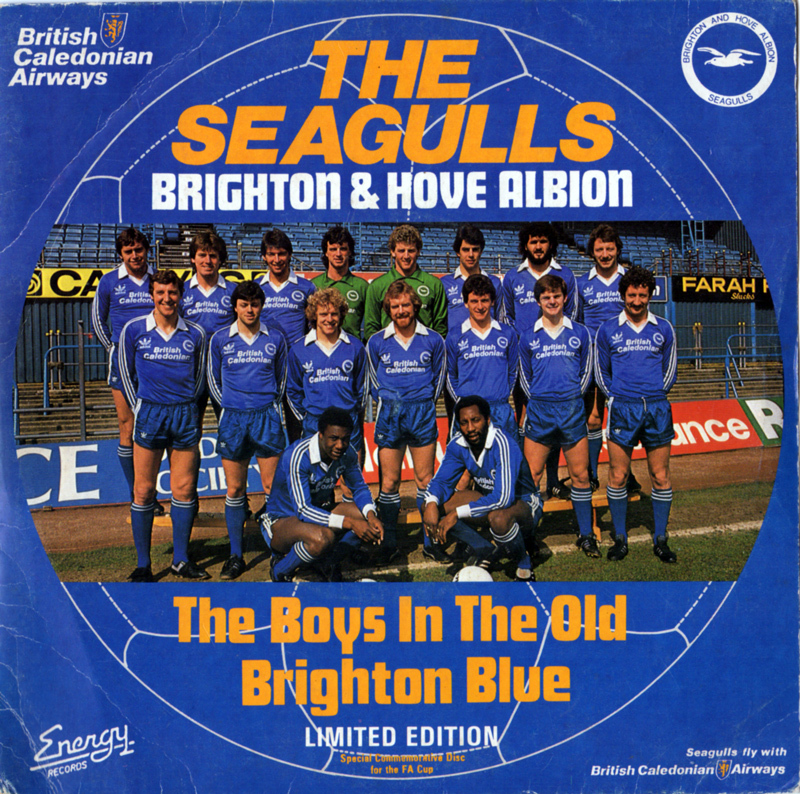 Relegation to the Second Division was hardly consolation – although the prospect of Second Division football would today have Brighton fans leaping about and counting the days till next season. Smith didn’t score. Well, not in the last minute. But what if Smith had notched? The most profound repercussions would have fallen on Smith himself, and not all of them that welcome. The close proximity of Michael Robinson, a strapping lad of no fixed hairstyle, would almost certainly have meant that Smith was in line for a lingering and passionate congratulatory kiss from the Eire international, and it is this prospect which many experts believe may have caused Smith’s fateful hesitation. 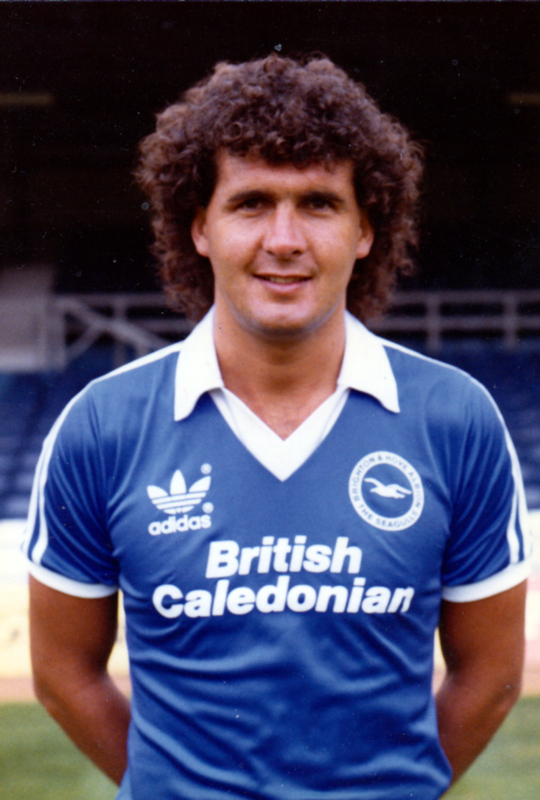 Brighton would have held on to Gary Stevens (a good thing) and Steve Foster (a good thing for Luton Town), whose Brian May hairstyle is coveted by Manager Jimmy Melia. The European Cup Winners’ Cup campaign would have been a brief flirtation – a la Robbie Williams and Anna Friel – with the Seagulls crashing out 4-0 on aggregate to Hungarian cable TV operators Videoton. United sack Ron Atkinson for his lack of success, and for his tactlessness in wearing more silverware at Wembley than the club has picked up in recent years. Candidates to replace Big Ron include ordinary-sized Ron Saunders, John Toshack and Graham Taylor, the manager with the Midas touch at Lincoln and Watford. Taylor gets the job, and clears out Bailey, Muhren, Wilkins and Coppell, and, after a surprise auditor’s report, Nobby Stiles, who United had mistakenly kept under contract since 1974. By keeping very quiet and hiding behind a boiler, Nobby had, without kicking a ball, been drawing a wage of thirteen guineas a week. 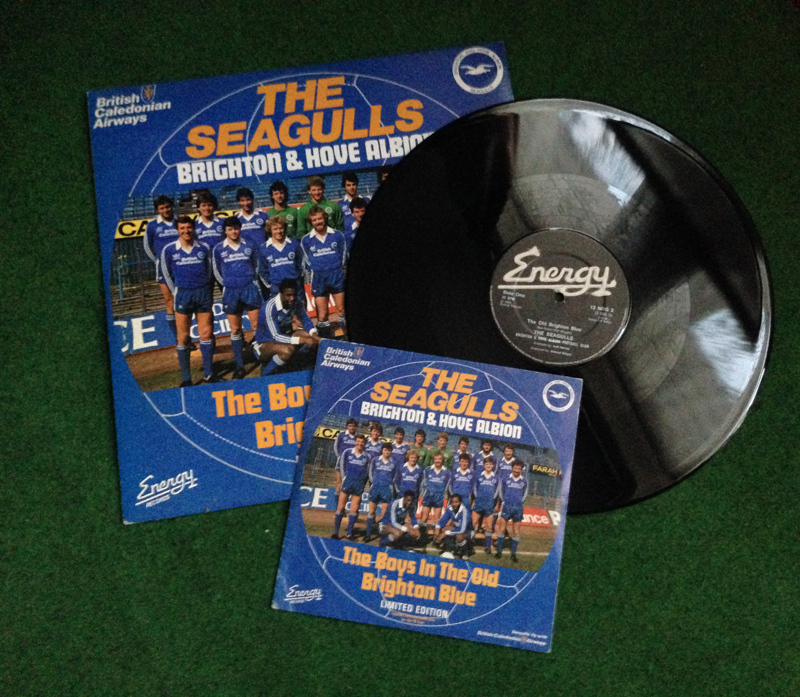 At Brighton, Jimmy Melia, the man who’d managed them to Cup triumph, is also sacked for supposed ‘financial irregularities’. Apparently, the substantial cash rewards the Cup had brought had gone missing, and investigations revealed that Melia had blown it all on a series of dubious hair restoration and transplant schemes, which left Brighton in dire straits but Jimmy looking like Michael Bolton. Graham Taylor puts silverware on the United mantelpiece within three years, and many of that Third Division championship winning side are still held in much affection by the supporters of Manchester City. Nick Hancock’s mould-breaking unfunny bloopers video, And Smith Did Score, is a best-seller in the Brighton area, where Gordon Smith has become the town’s very popular mayor. 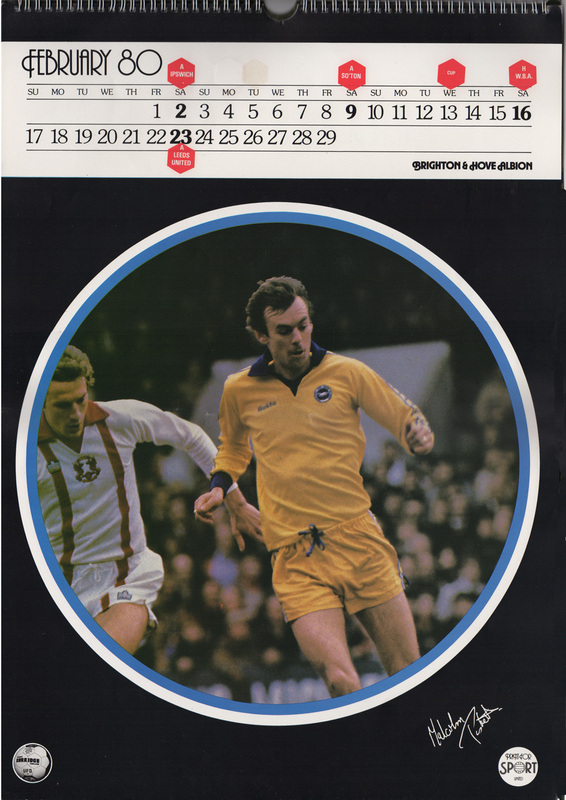 Happy New Year …with Albion Calendar 1980! 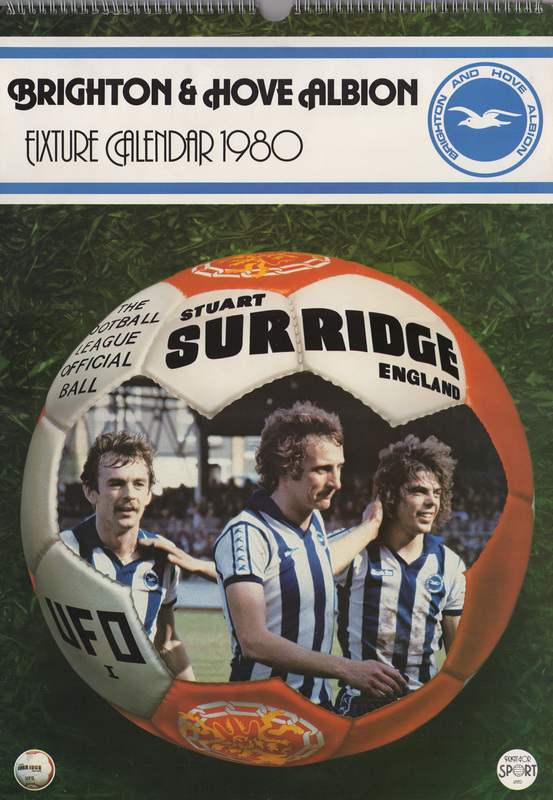 Short of Peter O’Sullivan, Teddy Maybank and Gary Williams turning up at your door tipsily singing ‘Auld Lang Syne’, what finer retro Albion way to see in the New Year than an invitation for you to feast your eyes on a Brighton football calendar from 1980? 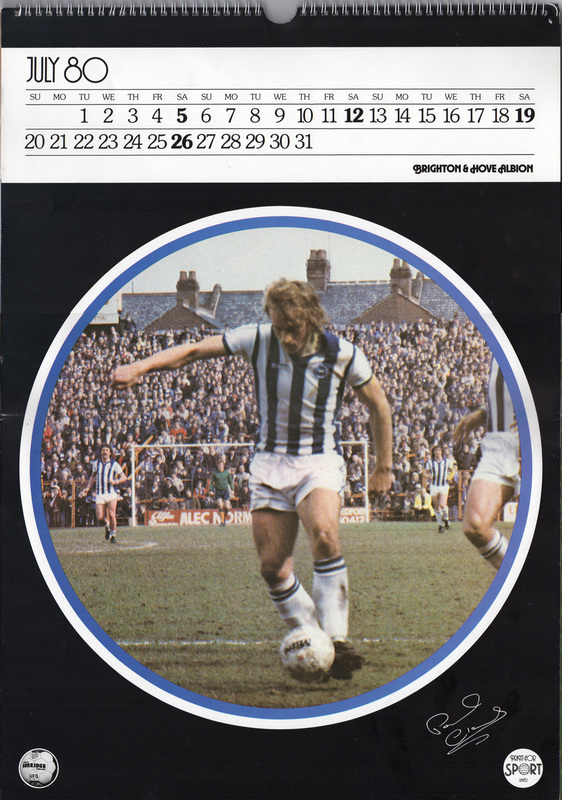 In 1979/80, a company called Print For Sport Ltd launched some lavish A2-sized Soccer Action Calendars for each First Division club, some ‘top’ Second Division clubs (West Ham, Leicester, Sunderland, Newcastle and Burnley, Luton and QPR) and the England team. 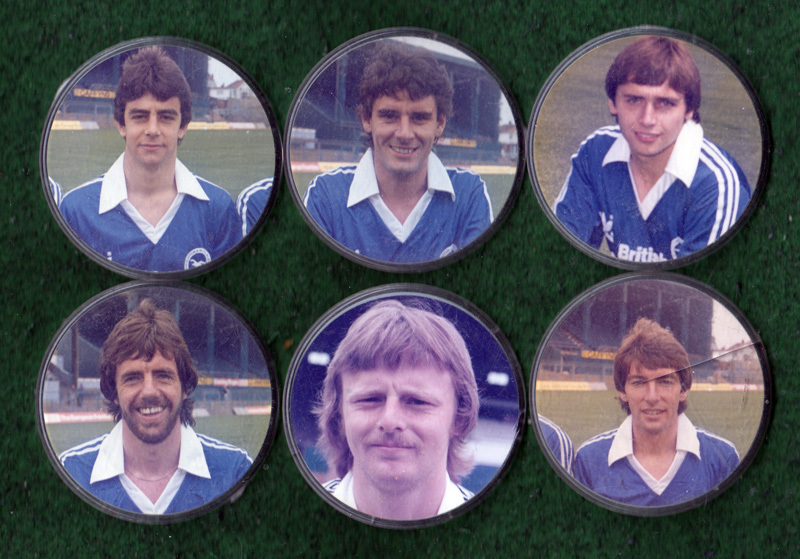 For just £2.49 each, you received one for your favourite team with twelve colour action shots of first-team players. The item, advertised heavily in the likes of Shoot! 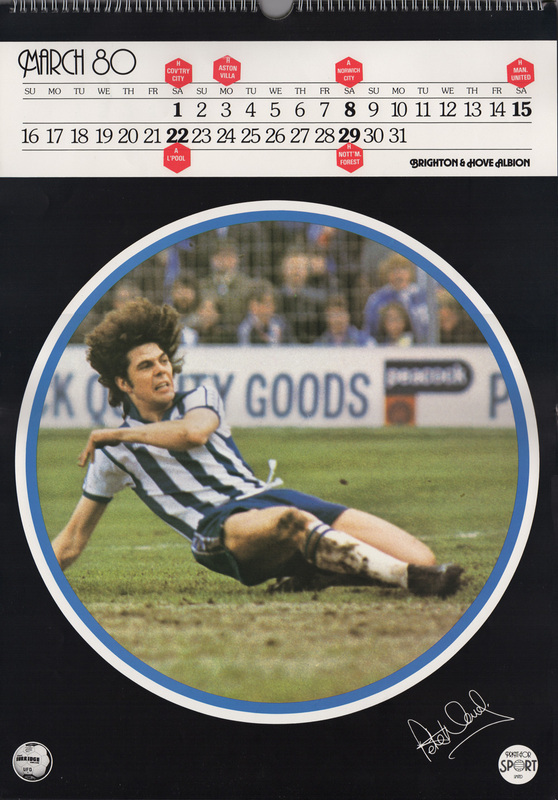 Magazine and Match Weekly, also included red ‘You-Fix’ stickers allowing fans to mark match dates and opponents on the calendar itself. 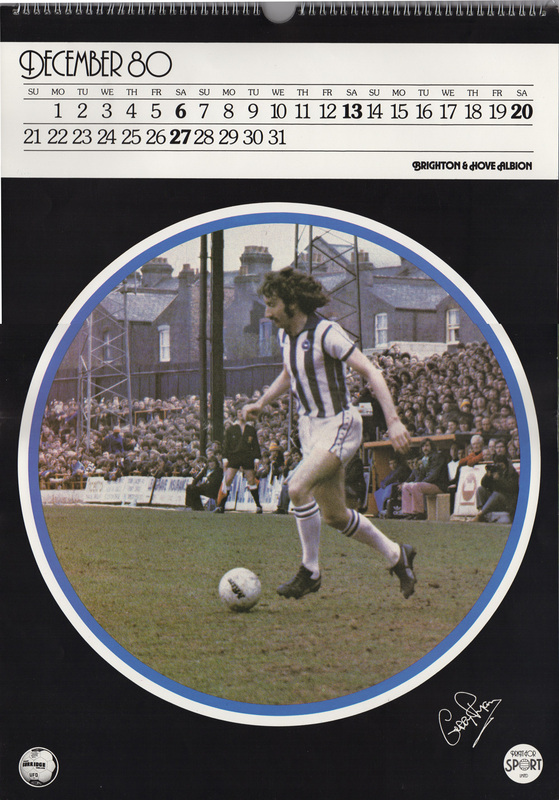 I suppose they could have pre-printed the fixtures directly onto the relevant dates themselves but this was what counted as ‘fun’ and ‘interactive’ in those days! In a clever, eye-catching design, Malcolm Poskett, Chris Cattlin and Peter Ward are the cover stars. 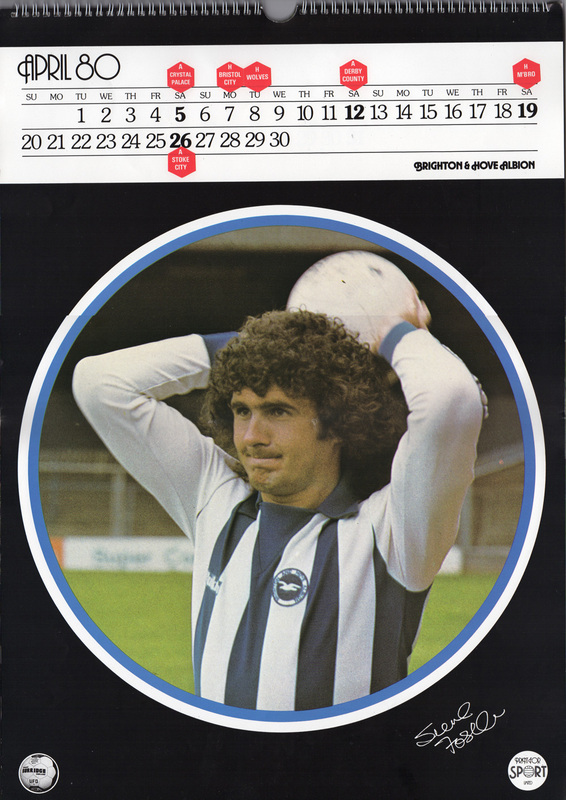 Then into January is… ermm, Brian Horton with a full head of hair in the perm? Well, it’s definitely Nobby’s signature on the bottom right but, as Alan Wares (Albion Roar) from North Stand Chat has identified, it’s Andy Rollings blocking the shot from Orient’s Alan Whittle in a memorable 3-3 draw. Peter O’Sullivan and Mark Lawrenson are in the background, along with Clark’s hair! Next up is Malcolm Poskett, also in action against Orient, out to prove Alan Mullery was right to prefer him to Wardy in the number eight shirt for this match. When Peter Ward does show up in March, it’s on a bad hair day. 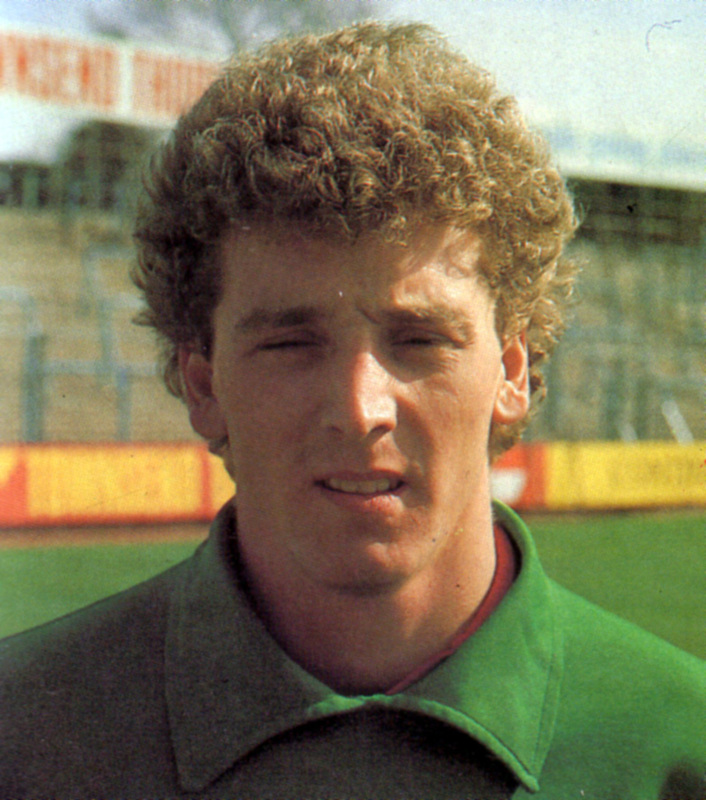 Steve Foster had signed for the Seagulls in pre-season in the summer of 1979. Without a genuine match appearance for Brighton to his name yet, he strikes a pose for the camera instead. In the same Blackburn game where he scored a goal in the midst of a smoke bomb going off, here’s Teddy Maybank challenging for the ball. Eric Steele shows a safe pair of hands for the camera. 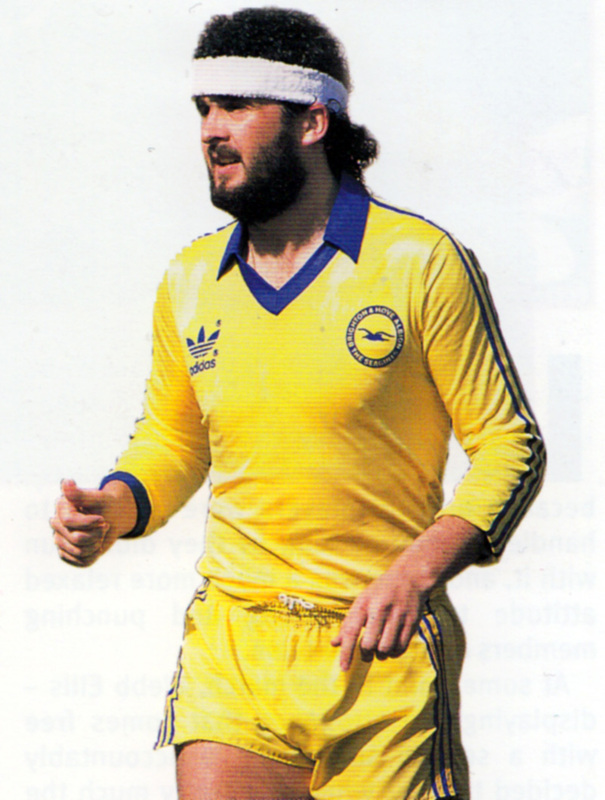 ‘Viking’ Paul Clark on the ball, possibly against Luton in April 1979. 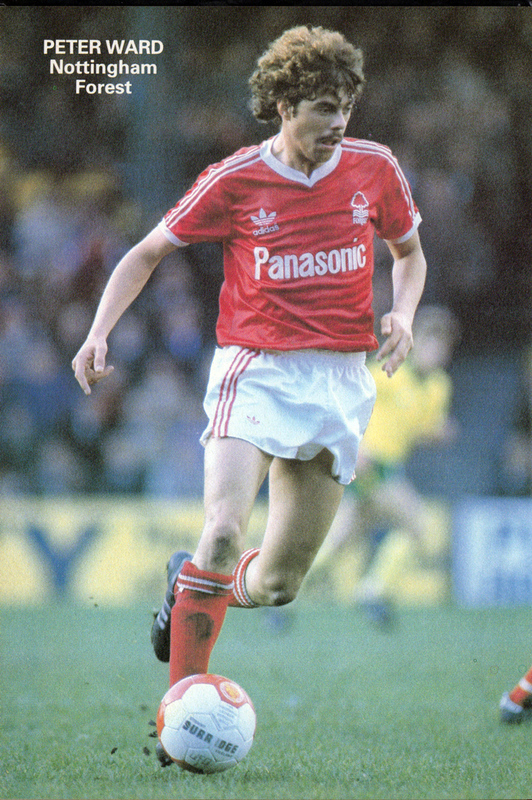 New signing John Gregory juggles the ball. 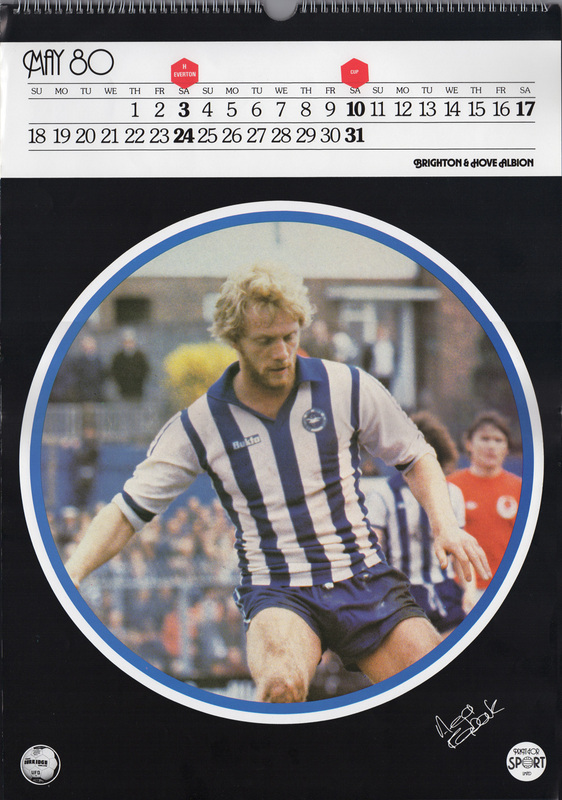 Veteran Chris Cattlin is star of the month for September 1980 even though his Albion playing were over by then. Gary Williams carries the ball out against Blackburn. Proving his acting skills are no better than his punditry skills, Mark Lawrenson fakes celebrating a goal! And finally, Gerry Ryan goes for a dribble. 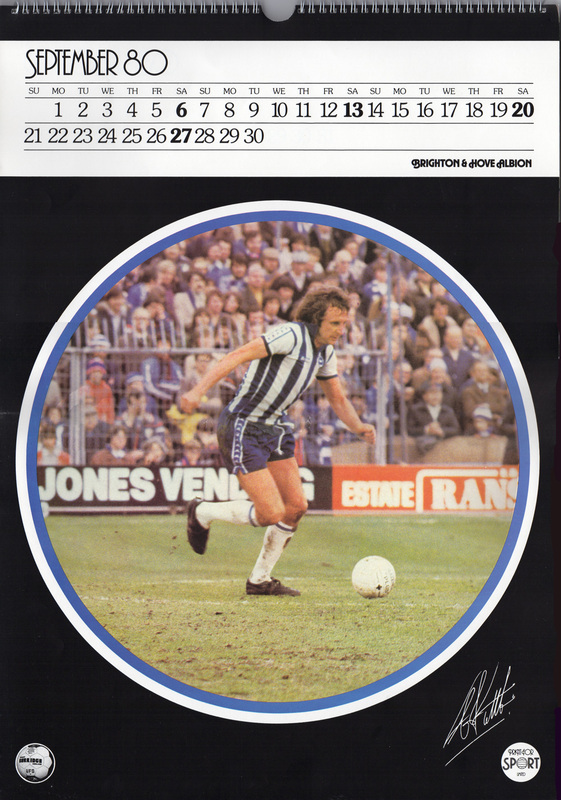 As you can see, 1st January 1980 fell on a Tuesday, whereas 1st January 2014 is a Wednesday, so you’ll be disappointed if you were hoping to print this out and use it, unamended, as your calendar for the New Year. Significantly, 1980 was also a leap year so you’ll have to wait all the way until 2036 before this calendar fits the bill again. Never mind! I hope that you are patient. In the meantime, Happy New Year!